Custom vacuum forming - find out how we helped others ! We've worked with many customers great and small to bring their ideas to market. Here's a historic selection. Toolcraft manufactured the parts for a radio-controlled model of the American Republic RC3 Seabee seaplane (as flown by James Bond in 'The Man with the Golden Gun') with a 100 inch wingspan. Model aircraft are commonly made using a wooden frame skinned in balsa wood or fabric, but the corrugated aluminium skin of the full size Seabee didn't lend itself to coventional construction. Our customer & Seabee enthusiast Jeremy Collins, decided to use vacuum formed skins to replicate the flying surfaces, floats and struts. 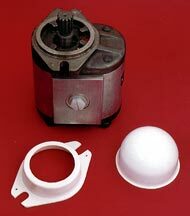 Masters were made from HIPS sheet, foam & automotive body filler, from which female vacuum forming tools were then cast in aluminium powder filled PU resin. Having made the tools, Mr Collins ran into difficulty finding a reliable vacuum forming service company willing to take on small run specialist parts. Toolcraft can make small runs economically and has a wealth of experience of adapting tools to suit its vacuum forming machines. After adapting the tools, Toolcraft vacuum formed all the parts, using materials such as clear PETG for the cockpit and HIPS for the skin. As the body of the plane shows rivets and panel details, it looks much more realistic and is quicker to build than the conventional alternatives. Images top to bottom: seabee body & wing, vacuum formed ribs clearly visible; part assembled seabee. Customised masks, vacuum formed by Toolcraft Plastics of Swindon, have replaced tapped entry ports of pumps in the paint shop area at a local manufacturer to prevent ingress of excess paint. The masks just 'snap' into place making a better quality paint job and being reusable are very economical. "Despite relatively low volume production, using in-house design & manufacture allows us to customise each job economically" quotes John Hemsworth, MD at Toolcraft. Whilst there are different pump sizes some have standard ports allowing some masks to be used on more than one pump. Some masks are also made in two parts for economy of production & easy use on multiple jobs. Toolcraft Plastics in Swindon recently worked with a seafood distributor to develop a mould for fish fillets. Toolcraft used a time and cost saving technique to get the moulds into production fast. The client sent Toolcraft a plaster cast of the required shape. It is possible to vacuum form from a plaster cast, but as plaster is fragile, it damages easily and very few formings can be made from it successfully. Instead, Toolcraft vacuum formed some new moulds using the plaster cast & used them to resin cast a completely new 4 impression tool within 3 days. Resin cast tools are suitable for 1000+ formings, which was just right for the needs of the customer, who is now producing breaded fish using the moulds. Images top to bottom: temporary plaster cast tool; resin cast v.forming tool; vacuum formed fish moulds.